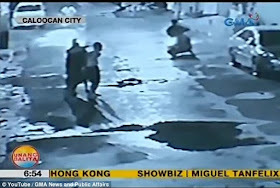 A suspected drug dealer was gruesomely executed in Philippines after being nabbed by vigilantes. He was held with his hands tied behind his back by two men as one shot him at point blank range in the back of his head. In the blink of an eye, both men calmly climbed onto motorbikes and sped off. Lying dead in the road, the 'drug pusher' is the latest victim of the Philippines deadly narcotics war, in which more than 3,000 people have been murdered since June. Vigilantes have a licence to kill with impunity since President Rodrigo Duterte declared war on drugs - and controversially claimed he would be 'happy' to slaughter three million users and dealers.